OmniOutliner is a great tool for creating outlines on the iPad that is simple to use, but gives you many options for making your outlines as robust as you want them to be. What OmniOutliner does not do as easily as create outlines is import ones that have been created elsewhere. Importing an outline created in Microsoft Word is especially problematic, even though you see Word listed in iOS’s Open In pop-over when you try to import a .docx file from Mail or another app into OmniOutliner. So if you use a Windows PC, it’s best to use OmniOutliner on the iPad as your sole outlining tool. If you use a Mac, it’s best to use OmniOutliner for iPad with OmniOutliner for Mac so that you can exchange outlines between your tablet and computer. Either way, after you’re done working on that outline, you can bring it into Word or Pages for your actual writing. 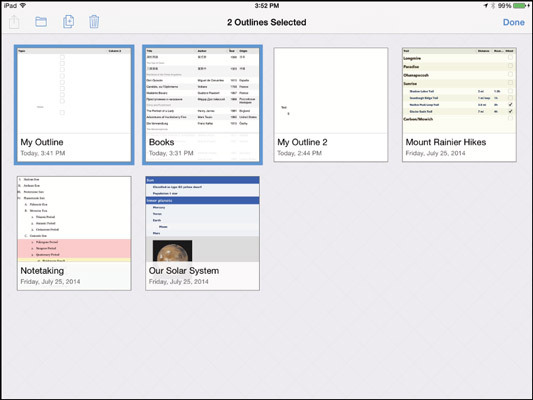 OmniOutliner also doesn’t support iCloud or cloud storage services like Box or Dropbox, though you can use Open In from those apps to send an outline file to OmniOutliner, as well as use Open In (via the standard iOS Share sheet, when selecting outlines in OmniOutliner) to send those files to a cloud storage service. It’s a bit of work, but possible. For most people, an outline’s formatting is simple because they do the formatting in their final document. But OmniOutliner lets you do fancier formatting because users often create documents in the app that don’t get moved to Microsoft Word or Apple Pages for further development — the outlines become project documents or complex task lists. The templates available for new documents give you a taste of that available formatting. To apply formatting to an existing outline’s text, tap the Text Style button (the i icon) at the upper right of the screen; then apply boldface, italics, or underline (which you can also do with the standard iOS text-selection contextual menu’s BIU option); choose an existing style; or create your own by scrolling down the Text Style pop-over and tapping Customize Style. The pop-over is called Text Style when you’ve selected text within a line and is called Row when the entire line is selected. The options are the same either way. In the Styles pane, you can apply a template theme, as well as apply paragraph and character formatting via the Whole Document, Level 1 Rows, and Notes menus. Create a new style by tapping New Style at the bottom of the pop-over, and delete or reorder styles by tapping Edit. In the Document pane, you can set the zoom level, background color, and color for alternate rows (as you would do in a spreadsheet or table to make it easier to distinguish rows from each other). Tap the Documents button at the upper left of the screen to return to your Documents view, whether that is Local Documents or Omni Sync Server. You see thumbnails for all your documents. Share: Lets you email or open a document in another app (you’re asked which format to export the shared document as), as well as create a template based on the selected document. If more than one document is selected, this button doesn’t respond. Move To (the folder icon): Lets you move the selected documents to a different folder as well as create a folder to move them into. Duplicate (the icon of two pages): Creates copies of the selected documents in the current location. Delete (the trash can icon): Deletes the selected documents. To get help with OmniOutliner, tap the Settings button (the gear icon) in the Documents view and then tap OmniOutliner Help. There’s also a free, excellent e-book manual for OmniOutliner available at the iBookstore; just search for “OmniOutliner” to find it.